Digital Wish runs the School Modernization Initiative, putting one-computer-per-child programs into 28 schools, in order to study the process of technology integration and craft strategies that will allow other schools to replicate success. 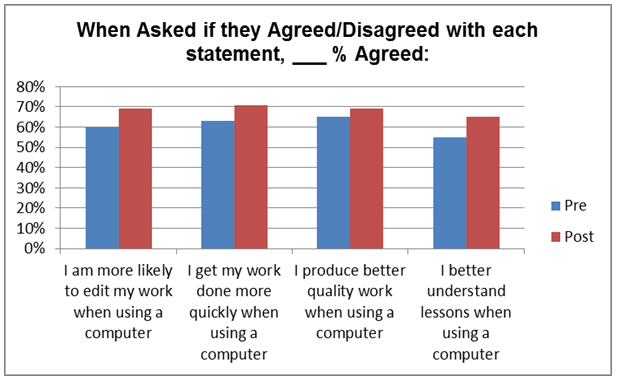 Every student and teacher in the survey received a dedicated computer for use in a 1:1 computing classroom with take-home rights, and a technology training class each week for 4-6 months. Data is self-reported by 30 teachers and 465 students participating in the replication phase of the School Modernization Initiative from September 2011 to May 2012. The data was collected through anonymous surveys conducted on www.surveymonkey.com. The same questions were asked in both the pre-initiative and post-initiative surveys. 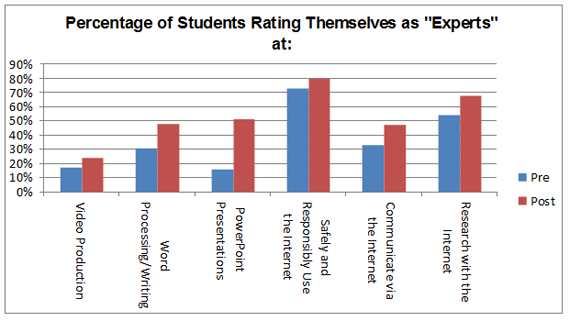 Both students and teachers reported increases in computer literacy, rising comfort levels with technology, and overall increases in engagement. The data reflects the difference in the responses given between the pre- and post-survey data. Different surveys were given to students versus teachers. Please be aware that the data collected shows anecdotal trends, self-reported by the teachers and students participating in the initiative. Digital Wish does not conduct formal research, nor do they make any conclusive research-based claims. Curriculum taught to grades 4-6. Workforce Prep - Over 90% of students say having technology in school is important in preparing them for the future. Importance - 83% of students say that it is important to their education to have their own netbook/computer during the school year. 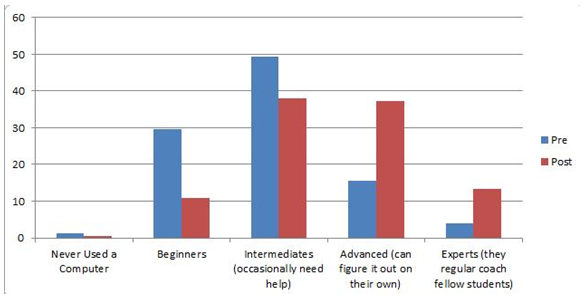 Skill - Teachers say that only 11% of their students are considered beginners with computers, a decrease from 30% pre-initiative. They consider approximately 50% of their students to be advanced/expert computer users, a value that has more than doubled since the 20% pre-deployment. Access to Technology - 100% of teachers now have a school laptop, up from 80% before the initiative. Frequency - The number of students who use a computer every day in the classroom more than tripled the pre-initiative levels, increasing from 20% to 65%. Students Becoming Tech “Experts” - The majority of students say they are experts at digital media, word processing, making presentations, safely and responsibly using the internet, solving problems using technology, and researching a topic on the Internet. 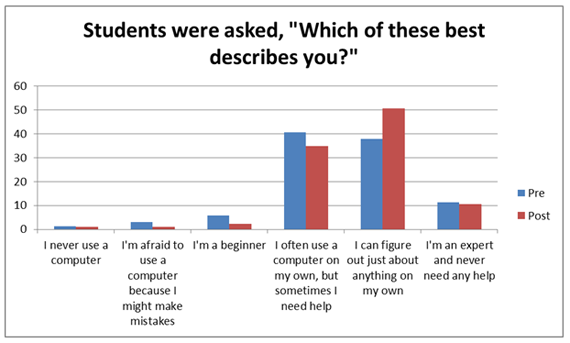 At the beginning of the initiative, almost 50% of students said they didn’t know how to do these things. Problem solving - Students who say they can “figure out just about anything on their own” increased from 38% to 51%, a 134% increase. The number of students who say they have participated in 10 or more technology projects that required them to solve a problem, gather information, or draw a conclusion, has nearly doubled, from 23% to 42%. Internet Safety - After completing the Initiative, 93% of teachers now say they are “comfortable” with Internet safety, with 67% of them saying they are “very comfortable”. Student Engagement - Student engagement increased 140% in word processing and writing, creating presentations, and video production. 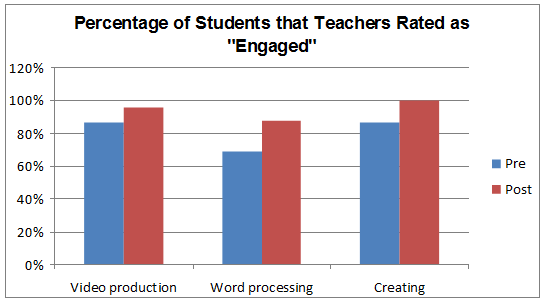 52% of teachers now feel that the majority of their students are highly engaged as opposed to only 37% pre-initiative. 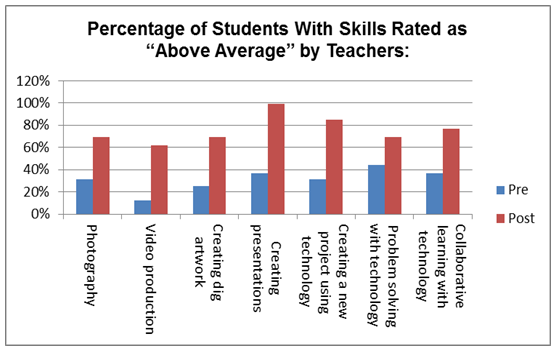 Creativity - Teachers now say that 46% of their students are experts or peer coaches in creating a new idea or original project using technology, a value that almost quadrupled the pre-initiative’s mere 12% levels. 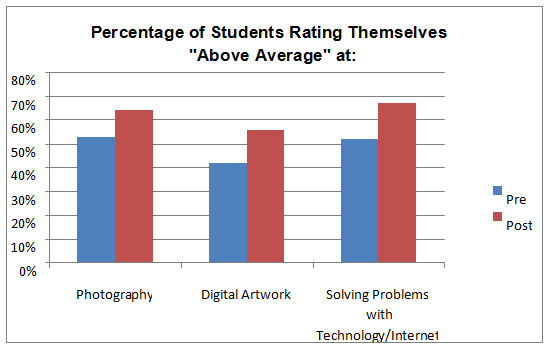 The percentage of students who said they’d like to have a career in Technology / Computers increased from 13% to 16%. Technology is very important to have because you can have a bigger selection of job options if you know how to use the Internet. I think the future will be based on technology so we should get ahead while we can. It makes learning like 20 times easier! I LOVE using technology in school, it makes me a little bit more happy to go to school now. Everything, and I hope for Digital Wish to expand to more than just Vermont, kids around the world should have a chance like I did. It is a wonderful program you have got here and I hope it continues. I enjoyed making projects and learning how to fix any problems all by myself. Learning how to type faster and learning not to believe everything on the internet and not to believe that all web sites are real. Learning about new programs because sometimes I could teach my mom about them. I enjoyed the stop motion films that we made. I made more when I went home that day. Digital Wish is very fun but my favorite was business because I loved using Windows Publisher and creating business cards. Now I know how to do about a thousand more things on the web. I taught my whole family how to use it. I taught my aunt how to make a Prezi and she took me to a convention in Chicago where she used her new skills! More Collaborative Projects - 24% of teachers now assign collaborative technology projects either weekly or daily. Pre-initiative, no teachers did this. 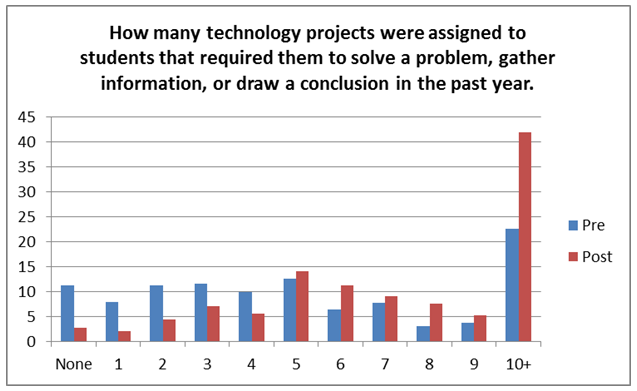 More Projects Assigned - 80% of teachers said they assigned 3+ major technology projects in the past school year that required problem solving, critical thinking, or analysis of information (only 30% pre-initiative). 7% of teachers assigned 10 or more projects. Increased Home Usage - Post-initiative, 39% of teachers send the computers home with students 5 times a week and 39% send them home 7 days a week. 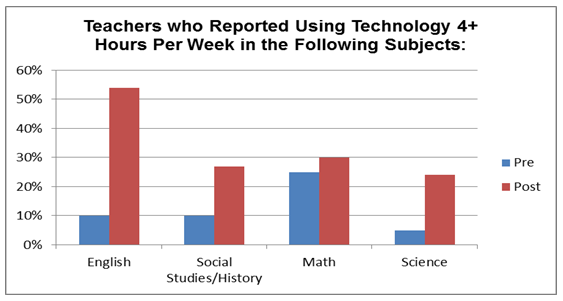 Increased Frequency of Technology Usage - The percentage of teachers who use technology in English, Science, or Social Studies/History four times a week or more, increased to 3 to 5 times that of pre-initiative levels. Increased Community Support - Level of community support that teachers said they received regularly, increased from 17% to 31% of teachers reporting they were fully supported by the community. Increased Student Excitement – Teachers rated 85% of their students as “very excited” about technology, an increase of 10% over pre-initiative levels of 75%. 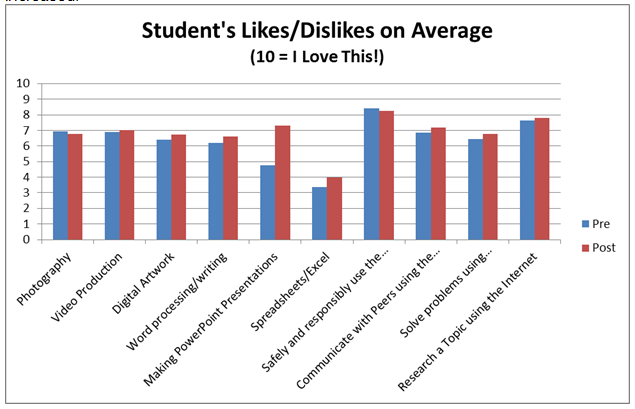 I have noticed much more student confidence on the use of technology. Motivation to do the work has been invaluable. Overall, students' attitudes have been that of wanting to know more. Students are very confident when given an assignment that incorporates the laptop. They are very good at listening to a computer-related lesson once, then working with each other to understand it better and putting it to practical use. 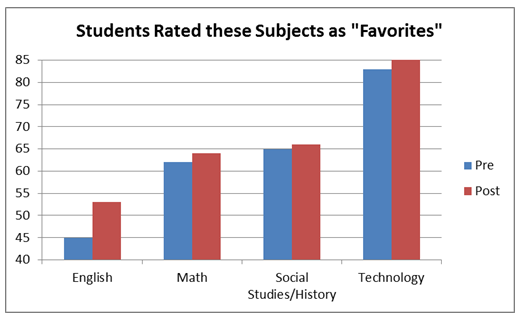 Students are more fluent with technology. They are able to select their form of expression using any of the programs we learned. It is nice to see the students coming to class these days, computers in hand. It's become second nature to them to immediately turn on their netbooks upon entering class and connect to my blog where most of my lessons are located. The work they do has improved in quality and quantity as a result of the repertoire of technology tools available to them--and the skills they have acquired through Digital Wish has resulted in more creativity and polish in their projects and presentations. I feel our students are better prepared for the demands of Middle School as a result of their experiences with Digital Wish. On behalf of our small school, thank you for contributing to the academic success of our students. We started our Newton Law study in science and decided to incorporate the stop motion videos into our science study. Students selected one of the laws and then were given backdrop materials and clay. They needed to bring the LAWS to life. The kids were very excited about this. Many of the students went home and created their own videos at home. It was wonderful.